The dilemma of a book reviewer is always how much to reveal. Should the review summarise the book chapter by chapter and risk boring the listeners to sleep? In any case, that approach is not doing authors any favours as there may be no further need to read the book. The other extreme is a general summation which is therefore brief but may not contain enough specifics to let prospective readers have a “taste of the pudding”. I have chosen a mid course. In the first place, the book’s rather academic treatment will not lend itself to a chapter by chapter approach even if I wanted to subject you to that ordeal. I plan to give you enough exposure to May’s mindset and therefore his approach to the subject. That way you get enough, but not too much. For instance in the US, there was this campaign: ‘5 Ways to Prevent Being Mugged’. Other examples given are campaigns to promote farming to strengthen the economy and another to promote low gasoline consumption. He summarised by saying advertising can be used to develop human resources, promote citizens awareness, preserve natural resources, and strengthen the economy. Out and out ethical lapses are about ads that are misleading, distasteful and socially irresponsible. This chapter dealt with the birth of APCON through the enactment of Act No 55 of 1988, amended by Act No 93 of 1992 and Act No 116 of 1993. The enabling laws mandated APCON to control advertising in all its aspects. It had the obligation to watch over advertising by ensuring approval of advertising copy before publication, monitoring of advertising after publication developing codes of practice, publicizing the code, and handling complaints from the public. The book reproduced the proceedings at a symposium on the ‘Advertising of Tobacco and Alcohol’. One of the speakers, a distinguished advertising practitioner urged authorities to clamp down heavily on the advertising of the two products, by being less forgiving particularly in the areas of sponsorship, encroachment into Sports, and use o f women as models. He said alcohol and tobacco posed serious threat to society at large with alcoholism costing the US more than 25 billion dollars yearly. I was intrigued that the advertising body may be carrying self regulation as far as to affect industry’s profitability. I was quickly put at ease when I read the eventual conclusion. The communiqué at the end of the symposium read, among other points. The advertising industry deplores any attempt to make advertising the scapegoat for any shortcomings in government efforts to control the consumption of tobacco and alcoholic products. The industry vehemently opposes any attempt to restrict in any way, the use of advertising to promote any product so long as the production, importation and sale of the product is legal within the context of the Nigerian law. The industry calls on any government in the country, state or local, that has restricted advertising in areas where the Federal Government has not placed any restriction to repeal those restrictions promptly. The book also dealt with manpower development in the industry. It lamented the paucity of specifically structured courses in advertising in institutions of higher learning which therefore placed a lot more responsibilities on the Educational Committee of AAAN. According to the author, Dr. Christopher Kolade, as a keynote speaker at an AGM of AAAN, touched on the subject of manpower development. He made an interesting observation. “Well trained and “brighter lights” of the broadcasting industry being prime candidates for the “talent drain” into advertising agencies”. I must admit the observation was spot on particularly in the 60’s and the 70’s. I readily recall well known broadcasters who answered the call to become leading lights in advertising such as Chief Olu Falomo, Femi Williams (Chief), Kehinde Adeosun, Biodun Sobanjo. I also plead guilty to the charge, having crossed over myself from broadcasting. The author took issue with the advertiser companies – the marketing organisations for not doing more for the development of advertising man power. After all they were the main consumers of the eventual product. The book reviewed the effort made by AAAN to establish an Advertising Academy and Governments’ involvement in the initiative. The book did not elaborate on how successful the move has been. Chapter 7 dealt with advertising and religion. From the references quoted by the author, you had a fair idea of his attitude to the proliferation of churches. He said Dr. Schunfielld (author of Those incredible Christians) referred to Christianity as “a movement originally Jewish and Messianic, struggling within a pagan environment, and became transformed into a faith”. I should warn him he is fishing in troubled waters and he may catch a queer fish. Some will consider his comment the equivalent of Rushdie’s Satanic Verses which may deserve the issuance of a fatwa. The point he is making though is that the exploitation of testimonials in religious advertising was so successful it became so controversial. His thrust on the subject is that there should be a balance between the need to promote the virtues of religion and the unfettered advertised promise of miracles. Understanding Advertising in the Integrated Marketing Communication Mix. Options and imperatives in Nigeria’s Advertising scene. Manpower Development: Are we doing enough? Protecting Advertising Standards through Self-Regulation and Partnerships. Collaboration towards Growth and Development of the Advertising Media industry in Nigeria. Advertising and Religion: Striking a balance. Trado-Medical Broadcasts: The path to acceptable national standards. Advertising Standards and Control: Need to streamline the process. Political Advertising: The role of the media. Do it differently: The 2002 Media Summit Revisited. The book also included many written papers at various seminars, and workshops of APCON, AAAN or the International advertising body, IAA. Among the papers included was one by Alhaji Maitama Sule, that erudite Minister of the First Republic. I am fascinated that he has something to say about advertising. He was of the view that it is imperative to scrutinize and develop advertising as the main instrument for integrating the African market of the future. According to the Dan Mosani Kano, advertising is very important in modern times, for we live in a world where one has to blow his trumpet, as no one will blow it for him. In all, there are about 14 papers by professionals making it a rich harvest for advertising students. There are very few typographical errors in the book. One or two sentences I would have cast differently for easy understanding. I may have preferred that the various papers reproduced from past seminars were not sandwiched between narratives. As it is they seem to be buried in places. The narrative would have flowed better while the papers would be prominent in a reference section. One other fact I felt was left out is situating advertising in its place in the overall Marketing mix. The author broke down the various aspects to marketing communication – which is Advertising, Public Relations, Publicity, etc. But the most misunderstood aspect of advertising is the tendency to almost exclusively relate the success or otherwise of a product or brand directly to the effect of advertising. I felt the author missed an opportunity to stress the fact that advertising is just a tool in an overall marketing mix that includes the product itself, how it is packaged, the price, distribution of the product etc. If one or two of these went wrong, the product would be unsuccessful however good the advertising is. It is always a trip for me to be reminded of the thoughts of great men of yore. For instance the book had among others, this quotation from former American President Franklin Roosevelt. Quite interesting. Well I have spent a substantial part of my life in advertising, but I think I would gladly give it all up to be the President of the United States. One other quote that I rather liked is one by Winston Churchill, the late British Prime Minister. He said: “Advertising nourishes the consuming passion of a person”. I imagine he meant that advertising nourishes the passion for consumption in a person. Now that is splitting hairs, and with the legendary reputation of Churchill for the spoken word, I better keep my thoughts to myself. Let me end with a story ascribed to Winston Churchill when he was Prime Minister. He was in the loo of the House of Commons, when the Leader of Opposition also came in to use the convenience; Churchill quickly zipped up and practically ran out. The opposing Labour Leader, caught up with Churchill in the recreation area of the house and asked why he departed in such frenzy. Churchill said: “I was only playing safe. It is well known that your wish is to nationalize everything you see that is big. I was afraid for my personal asset”. 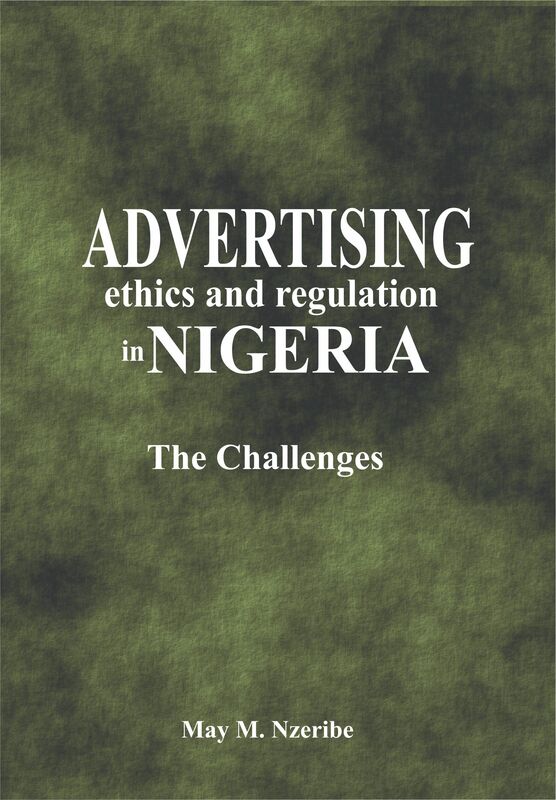 The book has 278 pages and is quite readable particularly by those in advertising or those who want an insight into advertising ethics, and the enforcement mechanism. The author’s practical experience of the subject makes the book an essential and invaluable read for all students of the communication art. The reference page at the end is detailed and accurate, thus you can easily trace any subject or person in the book. I cannot guarantee that on reading the book, you would wish to drop everything else like Franklin Roosevelt and become an advertising man. But I guarantee you would enjoy it, and learn from the master himself. Mr Dele Adetiba, the former Managing Director of Lowe Lintas Nigeria (a leading Advertising Agency) was the reviewer at the public presentation of Advertising Ethics and Regulation in Nigeria: the Challenges on Tuesday, March 27, 2012 at The CLUB, Lagos Sheraton Hotel and Towers, Ikeja, Lagos, Nigeria. ← Previous Post Enabling an Atmosphere of Protests? Next Post → From the Archives: What Happened to Abacha’s Vision 2010? pls. how can i get this book. i leave in Makurdi, Benue state. Please contact APCON for a copy of the book at any of our Zonal offices Lagos, Abuja, Port Harcourt, Ibadan, Ilorin, Enugu, Owerri, Kano, Kaduna. You can place your order there and have it delivered to any of the Zonal offices. how do i get a copy of the book and how much? i live in Port Harcourt. 08038999435.
the review of this book is a neat work and i give kudos to the reviewer. Reviewing a book involves critical thinking to be able to use the right words that will convey the right meaning. critical review is much more than explaining an article or a book, it involves creating a kind of angle that exposes both sides of an argument. osariemen bello (caleb university, imota, lagos) I really love this book, you guys really did good in this book. Secondly it explains everything one needs to know about advertising.More grace to your elbow. OLUKOYA FUNMILOLA (CALEB UNIVERSITY, IMOTA LAGOS). reviewing a book practically involves critical thinking. The right usage of words are to be used in order to comprehend what the writer is trying to pass across. A good job was done in this context. judging from this review, it is apparent that this book contains the laws and principle that guide advertising and i suggest every advertising and public relations practitioner should get a copy, read it and act on it. Ethics is very important in any organisation. Ethics is the backbone on which performance lean on.Although there seems to be an overlap between ethics and law and also ethics and etiquette.Ethics is the focal point that ensures stability, continuity, orderliness and development of any organisation and the state. How can I get the book in Jos, Plateau State? please I need materials on challenges of advertising in the hospitality industry. am a student of marketing. Thanks for the wonderful review. I’m writing on “Ethical Issue in Political Advertisement” any idea on how to start?